Chinese and US troops initiated a joint humanitarian aid and disaster relief exercise in Hawaii on Tuesday, November 12. The three-day joint drill, which marks the first time for China to send its troops to US territory, focuses on providing emergency aid in a third country presumably hit by a devastating earthquake. According to China's Ministry of National Defense, the drill -- incorporating the three major subjects of weapon demonstration, technique exchange and cooperative action -- covers fundamental missions such as retrieving survivors, navigating through narrow passages and providing medical aid at high-altitudes. Samuel Locklear, commander of the US Pacific Command, said the US hoped to enhance its cooperation with China through the joint drill. According to him, humanitarian aid and disaster relief are common interests, shared by all Asian Pacific countries. The joint exercise can benefit the mutual understanding and trust between both countries. 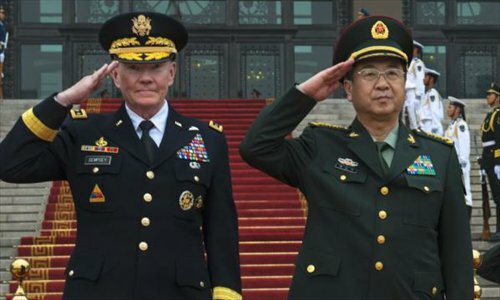 China and the United States have taken their military exchanges to the next level over the past few months. In addition to the joint drill in the Gulf of Aden and frequent exchanges and visits between both sides in the second half of this year, China will also join the military drill – the Rim of the Pacific 2014, initiated by the US next year.